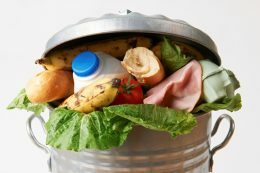 Food Waste – You Asked It! More than 1/3 of all available food is not eaten due to waste or loss. The U.S. has an abundant supply of food to feed all people, but much of it is wasted. Now is the time to change! What will you do in your communities to get the conversation, education, and champion in reducing food waste? Tossed food reduces economic growth, reduced community health, and damages the environment. Did you know that of the total waste that ends up in landfills, 21 percent is food waste? Because of this, food is the primary contributor to total U.S. methane emissions, a potent greenhouse gas, that comes from landfills. So what do you do to reduce food waste? What does your community do to reduce food waste? The challenge to reduce food waste starts with every consumer. Start by buying only the groceries you need. Making a weekly menu plan and creating a shopping list can help. Store foods properly. Do you have a thermometer in your refrigerator or freezer? This can help you monitor your appliance and can help determine food safety if the power goes out. Keep foods covered to prevent cross-contamination and reduced food quality. Learn more about how you and your community can help reduce food waste at www.ksre.k-state.edu/foodsafety/topics/food-waste.html. Think twice before tossing that unfinished meal or imperfect food. Each day, U.S. consumers toss about one pound of food. That is equivalent to one-third of the daily calories each person eats. Some of the healthiest foods that are wasted are fruits and vegetables and mixed fruit and vegetable dishes followed by dairy and meat and mixed-meat dishes. Food waste happens in many other points of the food chain besides at home. When foods are wasted, losses are also felt in the environment, farmers time, land and other resources used to grow and raise food.